Google and YouTube have been pushing their users harder for full identity disclosure, but is that really in your best interest? Before you commit to giving out your real identity across your YouTube and Google+ accounts, weigh the pros and cons with this list I’ve put together, and then decide for yourself if it’s really in your best interest and not just Google’s. WHY PUSH FOR FULL IDENTITY DISCLOSURE? Although YouTube is the 2nd largest social network, it has a big problem with quality control. In its Community Guidelines, YouTube explicitly encourages users to leave comments and rate videos that affect them. However, there are some users who feel the need to make overly hostile and personal attacks, and hide behind anonymity. “If you scroll through any popular video you can find hate filled comments almost every time.” Says Mike Essex, Online Marketing Manager at Koozai.com, a UK-based Digital Marketing Agency with their own prolific YouTube channel. “One argument is that if users’ accounts include their full names, people will feel more accountability as a result produce civil commentary.” says Ashlei Williams, a reporter with Young Moguls Nation. There’s also the argument that pushing for full identity disclosure across social media channels will encourage more voices, with more people being willing to comment with at least some additional assurance that they’ll won’t be harassed by an anonymous individual or group. Trustworthiness. People are more likely to trust information from familiar sources; and disclosure is what builds transparency and trust. ReelSEO’s Chris Atkinson mentioned a 2009 Neilsen survey that showed that users trust information from people they know more than information provided from search engine results. A more recent survey put out by Edelman Digital, the 2012 Edelman Trust Barometer Report, indicates that people place the most trust on those they consider to be their peers. Google’s authorship program allows Google to verify the author of a web page by having search results point back to the person’s Google+ profile page, which is connected to that person’s self-identified YouTube channel. Selectivity – You have the option of keeping particular videos private. Author rank: “What’s good about the real name change is that it’s a great way for people to link their Google+ property with their YouTube account. For those authors who want to have their YouTube content added to the value to their AuthorRank then it’s a fantastic addition, especially as this could later help the ability of that content to rank if someone is seen as a strong author.” – says Essex. Convenience: Saves Google+ users from having to log out of email anytime they switch between their multiple YouTube channels. You can keep your password confidential for multiple-admin settings. “Right now, allowing collaborators access to YouTube means giving them your password credentials which is clearly not ideal.” says Atkinson. 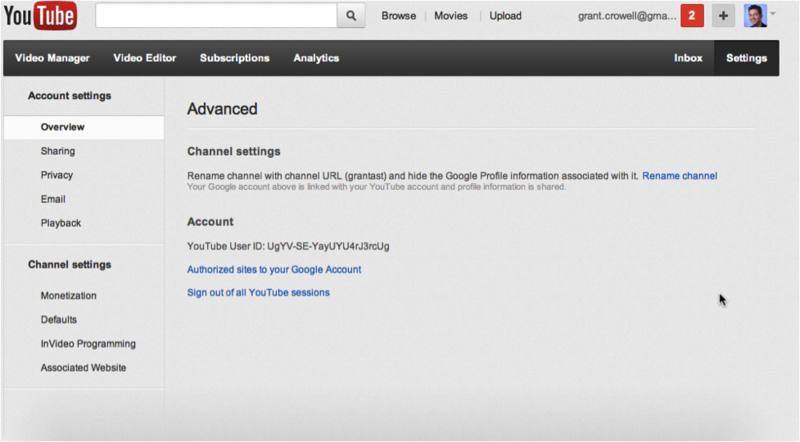 It’s reversible: You can always go back to your original YouTube username through your Account Settings. Problematic for online video platform providers with merging multiple-admin accounts from the YouTube API. I’ve personally dealt with one OVP having serious issues now with merging the YouTube accounts of their clients where multiple admins exist. It’s a strange situation, because you could be just using multiple email accounts of your own, and those all count as multiple admins treated the same way as different people. •	You want to build your brand as an individual. •	You don’t want to build your brand as an individual. While using a full name from a Google+ profile might work well for a creator who wants to build their brand as an individual, this simply doesn’t work if you don’t want a full name on your channel. •	You have certain videos, comments, and other activity on YouTube you want to keep posted, but wish those to remain anonymous. Review ALL your inventory: Review your existing videos, and your posted comments. See if there is anything you wouldn’t want to have linked to your public profile. It’s easy to forget a comment you may have posted anonymously. Remember, everything you decide to keep up will be traced back to your full name. Talk with any OVPs you work with that are integrating YouTube’s API to manage multiple accounts. Have them test out a YouTube account set up with multiple admins and see if they need to make any tweaks. Decide if it’s time to create a second YouTube channel. This might be a better place to have full identity disclosure and what’s associated to your Google+ Profile or Page. Otherwise, you may want to consider deleting the questionable videos and comments on your existing YouTube channel (the one you set up for full identity disclosure), and repost those on a new undisclosed YouTube channel (that isn’t linked to your first YouTube channel). It’s certainly a lot of manual work to do, but it allows you the opportunity to keep some things anonymous. Let all Google+ Profile and Page owners be allowed to link to their own website from the YouTube annotations feature, like what’s already being provided for YouTube partners. Full disclosure should come with an incentive just for YouTube users that doesn’t just serve Google’s own search strategy. “Multi-Admin User Capabilities Finally Coming to YouTube with Google+ Page Integration?” – ReelSEO, Chris Atkinson, November 2012. 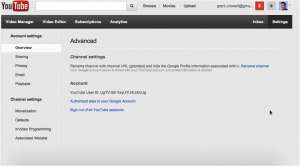 “Coming soon: Link your channel with a Google+ page (and keep your channel name)” – YouTube Creator Blog, November 19, 2012. “Global Advertising: Consumers Trust Real Friends and Virtual Strangers The Most” – Neilsen Wire, July 7, 2009.